It was a tough start to the week for me--- I had meetings after school both Tuesday and Wednesday and didn't get home from school until 7:45 Tuesday night! The last two days have been snow days, though, and they have been my saving grace! All that being said, I still can't believe I haven't posted in a whole week! I have 3 posts lined up for next week, though, and I am hoping to get back into the swing of things! Today I thought I'd do a random post, linking up with the sweet ladies, April, Christina, Natasha & Darci, for Five on Friday. In addition to school demands lately, I have also been working to plan a baby shower for Erin of the blog Attention to Darling. I am hosting with 5 other ladies, but kind of took the lead, and can't believe that the shower weekend is finally here! I love party planning and can't wait to see how everything turns out tomorrow. We are going with a baby chic theme, decorating with golds and corals. We pulled the colors from Erin's nursery...you can see her fabulous inspiration board for it here! I designed and ordered the invites through Paperless Post and had a great experience! 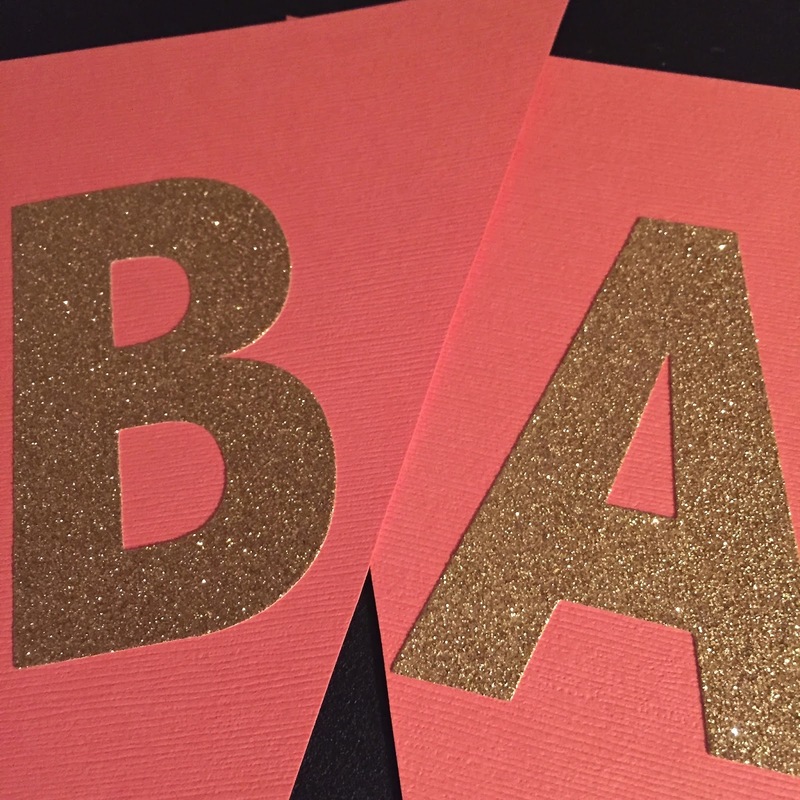 Here is a sneak peek of a banner I made for the shower! Remember my "Camo?" post!? Well since, posting that a few weeks ago, I have discovered the cutest camo jeans at Loft and they are on sale right now! They come in both modern and curvy fits and I am thinking I need to head to the mall so I can try them on! Last night I came up with these chicken cordon bleu roll-ups and they were so so good! They made for a pretty light meal paired with caesar salad and I have a feeling they might become a part of our normal rotation. I am planning to post the recipe next week! 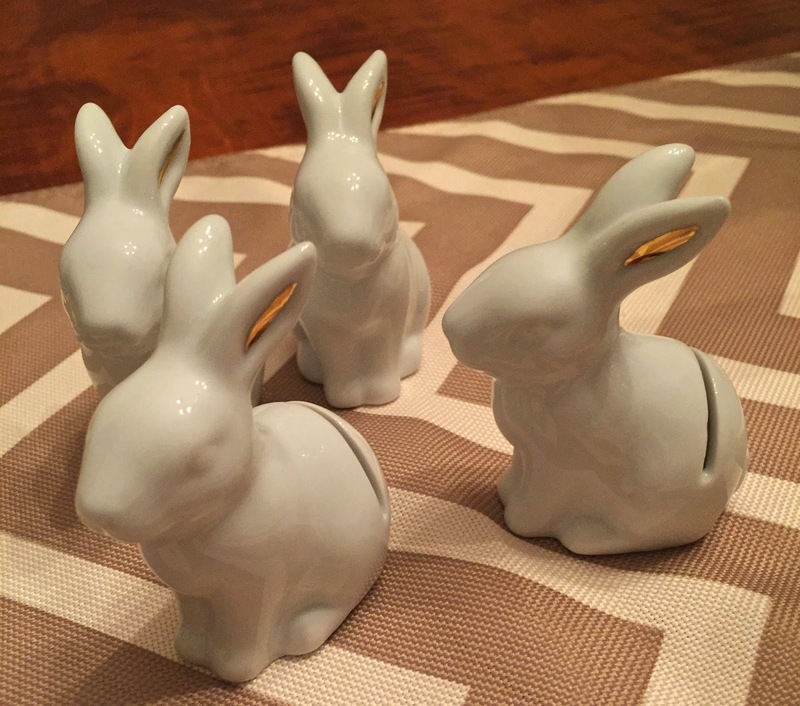 I picked up these little bunny place card holders at Target last night and am in love! They are very Antrho-esque, are they not? Easter decor is my absolute fave...all the pastels just make me happy and I have loved bunnies since I was a little girl. We will likely be having Easter brunch at my parents' again, and I am thinking they will be perfect to put labels next to all the foods, as we typically don't do arranged seating. I might even have to go back to get a few more! They also had adorable salt and pepper shakers, a candy dish, and a cookie jar. I am loving this pin! Y'all know I love a bold, bright print and that blue color is so cheery! You can see the whole sitting room space here and can follow me on Pinterest here...I have 13 different Home Inspiration boards full of even more eye candy like this! So there you have it...5 random snippets from my life lately! I'm headed to a baby shower this weekend too! I love the gold and coral theme you planned! Can't wait for the recipe next week either :) Have a great weekend! I love the invite you girls chose! Can't wait to see how the shower turns out - have fun! Oh loft pants are the best. Can't wait to see how you styled the camo print. So much to discuss on this post! I have those pants.. Love! I also saw those cute bunnies..I passed on them but may go back..too cute! And I can't wait until your recipe is posted! Those roll ups look so delicious, I'll be looking for the recipe post! AND those bunnies, oh my goodness I have been swooning over them along with their mom the candy dish and dad the statue, so stinking cute! Stopping by from the Five on Friday link up! I love bunnies, too! I had resist buying the entire shelf in Target this week! Looking forward to the roll-ups recipe they look soooo good!! This post makes me so excited!!! Thank you SO much for all your fab work on the shower! I just know it's going to be so amazing!! I'm also super in love with those little bunnies, too cute! I saw those bunny placeholders at Target, and thought about picking them up. Since we don't have a table, I resisted, but it's such a good idea to use them to label the food. I'm hosting Easter brunch, so I think I need to go pick them up asap! :) Also, love the planning for your friend's shower. 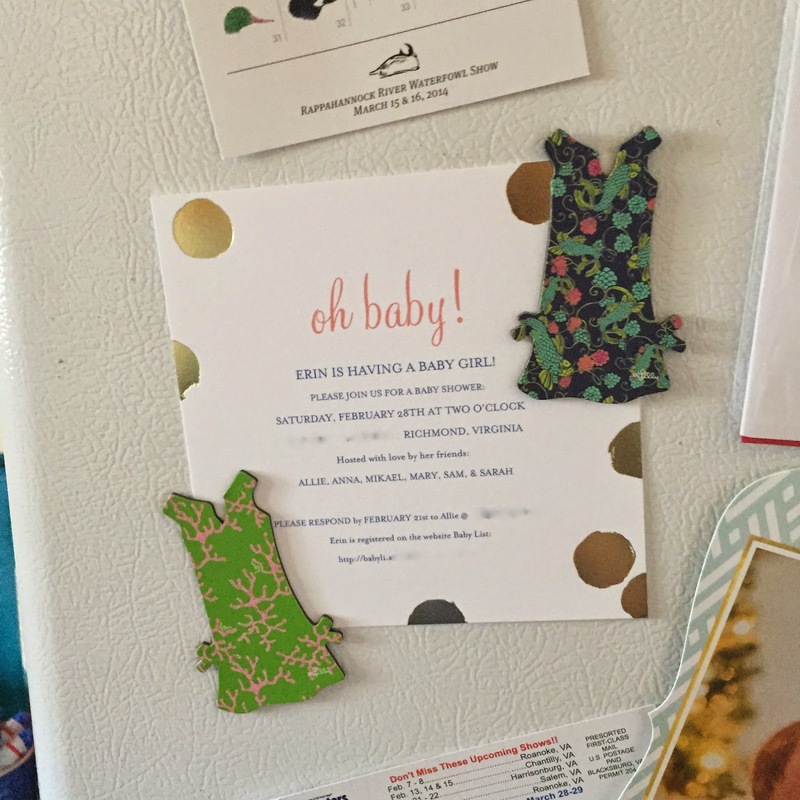 The invitations are so fun! Making me want to pull out my Easter decor! And yes- loving that gorgeous pin! Swoon!